Blue Dolphin "Nicest House on the Island"
150' on the ocean/5-7bedrooms/5-6baths/private/additional sofa beds for a group! Thank you for your interest in our beautiful 5 bedroom/ 5 bath / sleeps 12, beach house, the Blue Dolphin. If your group wishes additional space we do offer our separate "lil Dolphin", 2Bedroom/Full Bath (sleeps 4-6) exclusively for Blue Dolphin guests (if not needed it is never rented independently to respect your privacy, so is available for your group to rent at anytime prior to arrival.) The "lil dolphin is located on the same property having it's own ocean view/full kitchen/roof top deck/veranda etc... Our new VIDEO TOUR, made last May, 2015, is wonderful to give you a feel of our "slice of paradise"!! Since the video we have retiled the entire main floor and pool area along with a fabulous addition to the living area, affording lots of space inside and out for your group to enjoy and "spread out"!! We also updated the roof top deck as well, making the Blue Dolphin again "The nicest house on the island"!! The "new paved road north also was removed from our property and placed along the edge of the lagoon making our property even more private and very very quiet as our property stretches from the ocean to the lagoon!! Our beautifully landscaped, very private and expansive 2 acre estate includes 150 feet of white sand beach right on the Caribbean Sea with a pier that's wonderful for snorkeling and fishing from and reaches back 700' to a beautiful wildlife filled, mangrove lagoon with another pier for fishing. We also have available to our guests 3 kayaks to carry you swiftly (5 to 10min. depending on the breeze) to the reef for your own private snorkeling adventures and a Belizean canoe and a small row boat for touring/fishing the lagoon. ___October, 2014: we built a resort size pier, complete with large palapa covered area at the end, stairs, fish table with running water to rinse off gear, making it an "unbelievable" place to fish, swim, morning yoga or coffee or just enjoy the ocean breeze viewing the reef or passing dolphins or bone fish!! ___November, 2014: San Pedro Town completes the 1st phase of the road north which ends 1000ft from our private drive making town a 10minute smooth golf cart ride away!! ___April, 2015: We completed our addition of two new bathrooms ensuite, making the Blue Dolphin 5 bedrooms/5baths with 3 being ensuite!!!! If needed we also offer, at an additional cost of $289/nite, the adjacent newly constructed, two bedroom/sleeps 6, 'Lil' Dolphin with its own full kitchen, living room, dining area for six and full luxurious bath and all the amenities of the Blue Dolphin house including; WIFI, Phone, cable TV, DVD, VCR, CD and I-Pod stereo and Air Conditioning. All seven spacious bedrooms have the wonderfully comfortable Tempurpedic beds. The 'Lil' Dolphin is offered EXCLUSIVELY to those guests staying at our five bedroom Blue Dolphin and would like more space...it is never rented without the main house for your privacy!! Upon arrival you will take a short, 15minute taxi ride to our beach house, the Blue Dolphin, they all know it. Or we can have your golf carts ready and waiting for you, this will also give you a chance to stop and do a little shopping before heading up 15minutes to your private vacation home, the Blue Dolphin! As there is only one road the adventure will be an easy one!!! Our fabulous caretakers will be ready and waiting to pamper you and take care of your every need. In addition to her doing the daily maid service, Gloria is a wonderful cook. Armando enjoys bringing daily coconut water and doing anything to make your stay the very best!! Gloria and Armando are a huge reason the Blue Dolphin has been so successful, they are a true delight and we feel very thankful to have them as you will as well!!! We can set you up with first class, amazing tours/diving/snorkeling, fishing, golf cart rentals and anything else you may desire for the best rates as your fabulous Belize experience is our focus and priority! The Blue Dolphin is within walking distance of the island's top restaurants or you can have a New York style pizza delivered pool side. Our guests also receive a 20% discounted round trip air fare from Belize International to the island of Ambergris Caye. We are originally from Minnesota and have made Belize our second home since 1998! We fell in love with the Blue Dolphin as it afforded our large family plenty of space, private pool with stools for a swim up lunch, shallow end for grandchildren and deep end for a refreshing dip!! The 3,000sq/ft pool area sits on top of a seawall provides a spectacular view and large areas for playing/gathering!! The large private yard provided our family enough space for volleyball and sports, relax in the hammocks and enjoy a bbq/picnic under the palapa! The location of the Blue Dolphin is stellar as the reef swings in, making it easily accessible for snorkeling/fishing or just making your own adventure with our kayaks. The Blue Dolphin is located less than 3miles from San Pedro town, an easy 10minute golf cart ride on a fabulous new road, providing our guests with a private paradise and all the conveniences the island has to offer! We are also surrounded by many restaurants, within walking distance, offering many local fares and experiences...too many to enjoy if staying a short week! We are still, after 17years finding new adventures to explore!! Besides enjoying the continuous new adventures of San Pedro, Mark and Joan have enjoyed their passion of dentistry and coordinate volunteers and help create and maintain volunteer clinics on the island as Belize is still referred to as a 3rd world country and with the large population of children, preventive dentistry has been the prime focus. Another passion is showing the volunteers all the wonders of Belize as well to make it a win win for all involved!! Our philosophy is "Life is a great adventure or nothing at all," giving one child a smile becomes contagious and never stops giving!! We truly enjoy sharing our beach home and more importantly truly care about your stay. Our goal is having your family/group of friends leave with magical memories to last a lifetime! The pool area the flows from the main living area is over 2500sqft and is set back from the ocean edge for fabulous views and upmost privacy. Lots of space for fisherman on our new resort size pier/second veranda deck for shade, reading...lots of space to share with friends and family and still have some alone time! Over 2private acres with wonderful fruits, flowers....daily coconut water provided by a simple request from Armando!! The carved mahogany doors and artwork are truly amazing and full of mayan culture! My neighbor puts it so eloquently "downtown San Pedro is Hollywood and we live in Beverly Hills!" 150' of private sugar sand beach! Very private property! The Blue Dolphin is designed for people to enjoy and share the water, reef, ruins experience in paradise with family and friends in the nicest house on the island! First class attention is provided by our caretakers who maintain the grounds, handle your maid service and all of your needs! They are island savy and best of all FABULOUS COOKS!! toilet, shower, WONDERFUL BATH LOCATED NEXT TO BEDROOM 1 ON MAIN FLOOR! toilet, tub, shower, bidet, LOCATED WITHIN MASTER BEDROOM, WITH LARGE DRESSING AREA!!! toilet, shower, BATH IS ENSUITE BEDROOM 3, NEW AND LOVELY!! toilet, shower, BATH IS ENSUITE BEDROOM 4, LOVELY AND NEW!!! toilet, shower, Bath is located next to bedroom, lovely! toilet, tub, shower, bidet, "6th bathroom" is located in "lil dolphin"
3 of the 5 baths in the Blue Dolphin are ensuite! The other two bedrooms also have their own bath which is adjacent to the bedroom door. All baths have full showers and the master also offers a bath tub! There is also a bath tub in the lil dolphin as well!! The Blue Dolphin is your personal/private resort!! With our attentive staff, ocean view, private pool, expansive tropical private yard, private pier, the Blue Dolphin is a fabulous private resort!!! 150' of beach is at your "private" disposal, enjoy!! White sugar sand makes up the 150' of beach front, perfect for sand castles/relaxing in a hammock in the front yard, a game of bocce ball, shell collecting!! Fabulous ocean views are seen starting at the roof top deck, second floor veranda, most bedrooms, entire main floor living area and pool deck face the Ocean/Caribbean Sea! Roof top deck for sunsets! 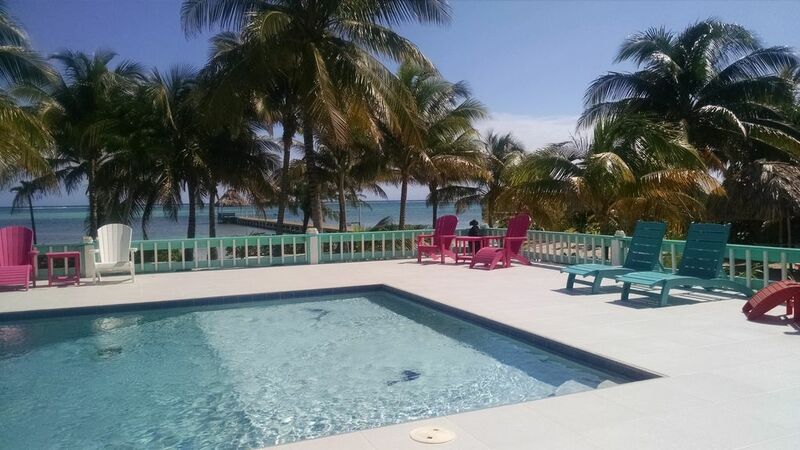 OUR PROPERTY IS LOCATED RIGHT ON THE CARIBBEAN SEA!! UNIQUELY OUR PROPERTY STRETCHES FROM OCEAN TO LAGOON! THE REEF IS TOTALLY ACCESSIBLE BY KAYAK IN A SHORT 5-10MINUTES!! The main floor bedroom's bath is wheelchair accessible. The entire pool area flows into the main floor of the house which offers living room/tv/kitchen/dining area! The southern entrance to the pool deck from the sand is a ramp to make "golf cart pick up easy!!" Belize is truly is our favorite vacation spot and the Blue Dolphin made it incredibly special! This vacation was hands down the best thanks to the property, Gloria & Armando and Lacie the house dog!! The Blue Dolphin & Little Dolphin are gorgeous, perfect space for celebrating my husband’s 50th with our group of friends and the location was epic!! We had 13 stay at the house and 6 more friends over for hanging out / meals - there was plenty of room! The house itself is so beautiful, great rooms and views. Loved the rooftop decks and the pool was PERFECT! We had so much fun hanging at the house & exploring. Bronco was the best taxi driver! Avis was awesome with the golf carts - hands down the best way to explore the island. Also the Lady Leslie snorkeling, nurse shark & Caye Caulker experience was insane. Front door service to our dock was excellent. We didn’t want to leave the bean bag chairs on the catamaran ;) Martin, Ricky & Jody’s service level (and food!) was top notch!! We felt so safe & well taken care of by Gloria & Armando - and all of the meals we had at the house were super delicious- simple, local flavor home cooking at its best!! Also Lacie was on point with keeping an eye out and she’s super sweet. We’re all dog people so having her around was really special. We cannot wait to come back, already planning to book again in 2021. Would highly recommend the Blue Dolphin - amazing accommodations, service & best location!! We needed a place with enough room for 9 people requiring separate beds. Mark was very accommodating with making arrangements for golf cart rentals and activities. The on site caretakers are a sweet couple that will get groceries and cook for you if you desire. We rented the guest house also. Very reasonably priced and a great value. Mark is also very good at responding in a timely manner and good at details. This is the second time our group of ten (5 couples) has stayed at the blue dolphin. It was just as spectacular as the first time. The space is ideal and the layout is conducive to couples having their own space but perfect common space. Gloria and Armando almost read your mind as they tend to the property. Plus lassie the house dog is a fun addition to the party! The house is in the north end of the island but still an easy ride via golf cart to anywhere you want to go. We’ll be back for a third! Gorgeous house with beautiful views!! Wonderful stay! Would stay again! Very nice, clean, and comfortable! We had 5 couples and had plenty of room, bar restaurant 3 minute walk on the beach a plus, private dock for boat trip pickups and heliport for tours on the property. Pool is great, comes with daily maid and pool service to get spoiled. We would definitely stay there again! Great home, we had 7 couples(we rented both houses) and all of us had a great time. Gloria and Armando the care takers were fantastic, Gloria's meals were outstanding and Lassie the house dog was also great. The Blue Dolphin is located a quick 10minute smooth golf cart ride north ( the 3 mile marker is just past our private drive)!! With 150' of sugar sand ocean front that sprawls over 700ft. deep to the lagoon makes our property not only very unique but truly amazing!! Our property used to be a coconut plantation and our staff enjoys bringing guests daily coconut water/meat as it is very very plentiful!! Our property also offers an assortment of local fruits, vegetables and herbs that our guests are more than welcome two!! Our location is stellar as you are surrounded by fabulous welcoming resorts and numerous restaurants galore...all within walking distance or relax by your wonderful fresh water pool and have pizza delivered! Since 2015 we have added many wonderful details, which are done constantly for guests enjoyment, such as large resort size pier with palapa (great for morning yoga looking out at the reef or reading a great book on one of the provided benches), stairs to the ocean to examine the many fascinating sea creatures hiding underneath or to hop on a kayak and running water to rinse off equipment or rinse you "catch" on our fishing table!!! We are extremely fortunate as the reef swings in at our location making the reef a short 5-10minute kayak ride away (we recently added two new kayaks for a total of 5 (3single 2 double) complete with all the bells and whistles making the short ride quite luxurious as well). When tying up at the reef on our buoy you will find the water knee to thigh high depending on the tide, making you own adventure just amazing, to say the very least!! If you are a savey water person you may want to capture your own lobster, when in season..ask Armando for the "hook"!!! Or, when conch are in season one oars and the other holds onto the rope to grab as well, if you have a seasoned eye for this!!! Mark and I are always excited and grateful to be able to share all the amazing things Belize has to offer. Upon confirmation, we will send you our personal guide of top current favorites and "must do" activities that we share when family and friends come for a visit!! As we have been greeting guests since 2000, we have just a handful of tried true and amazing locals that are sure to enhance your stay and leave you with fabulous memories for years to come...your positive experience is our priority! Star gazing!!!! The 2nd floor veranda swings around the exterior to stairs which will take you to the roof top deck!! THIS IS AMAZING as there are no city lights around which, even when cloudy, is a stellar view..always a few shooting stars and be sure to have someone in your party "load the sky app" for a intimate and exceptional tour of the sky!! The sunsets across the lagoon, so meeting at the roof top for a refreshment at 5:30 everyday is a must and also just enchanting to review the days amazing adventures!! Diving or snorkeling, Belize offers some of the best..I have lots of photo's I can share that were taken right in front of the house!!! The most frequent comment we get from our guests is that the house is much more wonderful than the website shows, maybe it's because we are just a "mom and pop shop"!! Armando and Gloria are truly an asset to the Blue Dolphin and love doing anything and everything to assure a fabulous stay!! Gloria is a wonderful cook of local dishes and has all the connections for fisherman to stop with their fresh catch of conch, lobster or fish if you desire at a great rate! If a fisherman is in your group best to arrange for that adventure the day after your arrival so you can enjoy the "fruits of your labor" during your stay!!! Armando makes a great BBQ and many of the fish taste just like chicken!! Many guests have Gloria make an arrival meal as it typically is a long day of travel and so very romantic to enjoy a beverage by the pool and wander in for dinner the first night! Upon confirmation we also send our guests a menu of her local dishes to start your planning, included is the grocery list for each meal which you or they can collect! Gloria is happy to cook everyday or none at all and can also plan a couple of hours before...we realize you are on vacation and our goal is to for you to bring home warm memories of your stay at the Blue Dolphin on Ambergris Caye!! We would love to host your stay!